Heat Meters Market size was valued over USD 760 million in 2017 and is anticipated to exceed 8.5 million units by 2024. 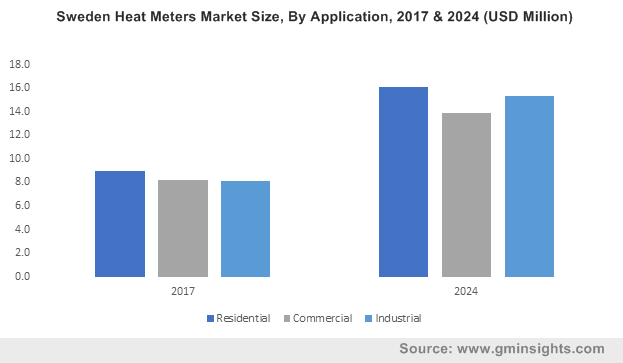 Increasing adoption of district heating systems coupled with rapid expansion of residential and commercial establishments will foster the heat meters market. Favorable government policies pertaining to energy efficiency along with growing concerns toward building emissions will favor the product penetration. The American society of Heating, Refrigerating, and Air conditioning Engineers (ASHRAE) in 2013, issued the energy standards. The reform lays mandates for submetering requirements across buildings higher than 25,000 ft and guidelines for energy efficiency & sustainability. Growing emphasis on effective energy management technology along with increasing demand for reliable and accurate metering system will stimulate the heat meters market share. Advancement in technology and digitalization of meters with deployment of IoT devices will further boost the industry growth. In 2017, Aalborg Energy Group has set up a contract with Kamstrup for digitalizing the district heating supply network in Denmark. The Project will include the supply of automatic remote reading system and 38,000 advanced heat meters. Ultrasonic heat meters market size was valued over USD 450 million in 2017. Low energy consumption, dirt resistant, durability, high data accuracy and long-term stability are some of the key features which will positively impact the product penetration. Rapid industrialization along with increasing demand for efficient and sustainable heating systems will propel the business growth. Vortex segment will grow on account of ease of installation, wide flow turn-down range and ability to withstand extreme temperature and pressure. The product comprises of non-movable parts resulting in low maintenance cost and effectively measure the heat flow rate. These meters work on the shedding principle and record the vibrations caused by a barrier placed in the moving stream. Growing demand for home automation system along with effective planning & management of energy consumption patterns will stimulate the mechanical heat meters market. Flexible integration with advanced metering and management systems owing to multiple readout interfaces will complement the business growth. Static heat meter market size is predicted to gain over 6.5% by 2024. Adoption of automated and advanced building technologies coupled with expansion of district heating systems across industrial & commercial establishments will stimulate the industry growth. 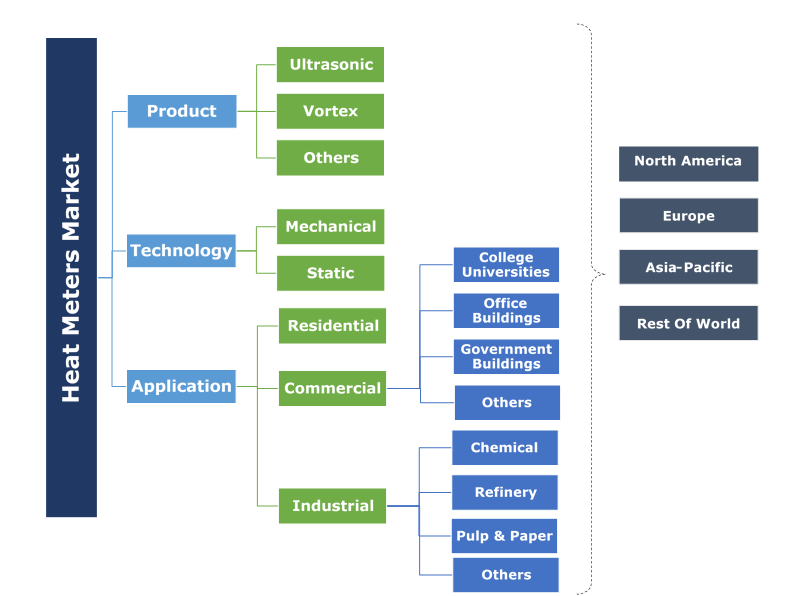 Increasing demand for combined heating and cooling application along with high precision data recording on account of its static measurement principal will encourage the product penetration. Residential sector is set to grow owing to stringent regulatory mandates coupled with accelerating adoption of district heating and cooling systems across the apartments. In addition, the increasing demand for individualized billing system for measuring the energy consumption of single unit across multi-occupancy buildings will encourage the product penetration. As per the provisions of Heat Network Metering and Billing Regulation, the domestic buildings must deploy the sub meters and more than one end consumer must be charged for the heat supplied. Industrial heat meters market in 2017, was valued over USD 200 million. Ongoing adoption of energy efficient systems on account of rising concerns toward emissions will encourage the product penetration. Growing need for real time data monitoring systems owing to the development of sustainable and advanced heating infrastructure will accelerate the industry growth. As per the U.S. Department of Energy, federal agencies are required to deploy heat meters, measuring at least hourly energy consumption. The U.S. heat meters market size is set to exceed installation of 510 thousand units by 2024. Ongoing regulatory mandates toward the development of policies for energy metering along with rising focus toward energy efficiency and cost saving will accelerate the business growth. For instance, the U.S. Department of Energy has established policies and guidelines for utilities for metering the energy consumption in their federal buildings. Favorable government norms pertaining to the adoption of sustainable energy devices along with rising concerns toward carbon emissions will drive the Germany market size. In addition, accelerating investments toward the development of service sector will further boost the industry growth. According to EU regulation EED 2012, The member states are mandated to issue policies pertaining to the installation of energy measuring equipment for individual apartment billing. China heat meters market will grow on account of rising adoption of cost effective measuring devices and favorable government policies to achieve energy efficiency. Increasing investments toward the development of manufacturing facilities will further propel the industry growth. Improved reliability & operations, rapid urbanization and theft protection are some of the prominent factors that support the industry expansion. For Instance, China’s 11TH FYP promotes heat metering across the medium and large size cities. Key industry participants across the heat meters market include Kamstrup, Diehl, Danfoss, Landis+Gyr, Engelman, Siemens, Techem, Itron, Qundis, Ista, Zenner, Apator, Secure Meters, Sensus, Micronics, MWA, Axioma, Huizhong, WECAN, Weihai Ploumeter, and Sontex. Technological innovations and increasing investment toward research and development are the key strategies adopted by leading industry players. Mergers and acquisition with technology providers along with growing expansion across the emerging economies have further strengthen their position in the industry. Heat meters, also known as energy meters are devices used to measure the thermal energy produced from a source and transferred to a sink. They find wide application across industrial plants and district heating applications. The meter is composed of three components including flow sensors, temperature sensors and calculator.